Home » Botany , Diseases in Crops , gxxk , Plant Diseases » List of Diseases in Crops or Plants caused by Fungi, Bacteria, Virus etc. List of Diseases in Crops or Plants caused by Fungi, Bacteria, Virus etc. Plant Diseases Caused by Fungi, Bacteria, Virus etc. » Plant pathology (also phytopathology) is the scientific study of diseases in plants caused by pathogens (infectious organisms) and environmental conditions (physiological factors). » Organisms that cause infectious disease include fungi, oomycetes, bacteria, viruses, viroids, virus-like organisms, phytoplasmas, protozoa, nematodes and parasitic plants. Not included are ectoparasites like insects, mites, vertebrate, or other pests that affect plant health by consumption of plant tissues. » Plant pathology also involves the study of pathogen identification, disease etiology, disease cycles, economic impact, plant disease epidemiology, plant disease resistance, how plant diseases affect humans and animals, pathosystem genetics, and management of plant diseases. » A plant disease is usually defined as abnormal growth and/or dysfunction of a plant. Diseases are the result of some disturbance in the normal life process of the plant. » Diseases may be the result of living and/or non-living causes. Biotic diseases are caused by living organisms (e.g., fungi, bacteria, and viruses). » A symptom of plant disease is a visible effect of disease on the plant. Symptoms may include a detectable change in color, shape or function of the plant as it responds to the pathogen. Leaf wilting is a typical symptom of verticillium wilt, caused by the fungal plant pathogens Verticillium albo-atrum and V. dahliae. 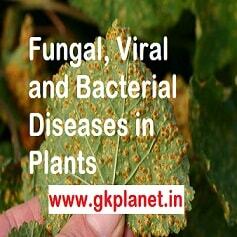 Thanks for reading List of Diseases in Crops or Plants caused by Fungi, Bacteria, Virus etc.